MobileFlyers is committed to permission-based email marketing practices, and as a result has established this no-tolerance Anti-Spam Policy. MobileFlyers will occasionally update this Anti-Spam Policy. (b) Unsubscribe - Each email created using MobileFlyers products contains an "unsubscribe link". Customers of MobileFlyers who try to remove the unsubscribe link will be warned that they are doing so, and if they persist in having the link removed or deactivated in any way, then MobileFlyers will have the right to terminate their account. (c) Purchased Mailing Lists - Mass mailings to purchased email lists are not allowed. 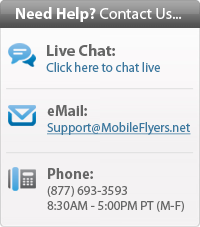 MobileFlyers only allows opt-in mailing lists. Purchased or inherited lists are by definition not opt-in. Similarly, you cannot use an email list relating to particular subject matter, and then use it for an unrelated topic. (d) Assisting any person in using the products or services of MobileFlyers for any of these previously mentioned activities. Please see the Federal CAN-SPAM laws. (h) Have you used a third party's email address or domain name without the party's consent? If you answer yes to any of these questions, you are likely involved in spam activities, and should contact MobileFlyers customer support service at [email protected]. Any MobileFlyers customer found to be using MobileFlyers products or services for spamming purposes may, at MobileFlyers's discretion, be immediately cut off from use of all MobileFlyers products and services and/or fined US $1,000 per occurrence, with no refund of fees that have been paid. MobileFlyers warns all of its customers when signing up that if they participate in spamming activities they will be subject to the loss of MobileFlyers services, fines and possible legal action. MobileFlyers has the right to actively review its customers' subscriber lists and email for suspiciously large broadcasts. If MobileFlyers finds any customers to be spamming, it will issue a warning, and if the activities are serious enough, MobileFlyers will take action immediately. If MobileFlyers has any reason to believe that the customer, despite warning being given, threatens to or is continuing to send spam, then MobileFlyers may take action immediately, including disabling the customer's account and/or reporting the customer and the incident to the proper authorities. MobileFlyers does not attempt to censor any content, nor to curtail the business of its customers. However, spam activities do not fall within uses authorized by MobileFlyers, and will not be tolerated. If you believe that you have received spam from or through MobileFlyers's facilities, please send a complaint from your email account along with the unsolicited email, with completed header, to [email protected]. Please provide any other information that you believe may help us in our investigation. MobileFlyers does not investigate or take any action based on "anonymous" spam complaints. MobileFlyers supports the efforts of various organizations working to responsibly eliminate spam activities. However, if an individual has opted-in to receive email from a customer of MobileFlyers, and then falsely or maliciously files a spam complaint against MobileFlyers or its customers, MobileFlyers will cooperate fully with the appropriate agencies to ban the complainant from use of anti-spam software and the Internet community.